The SNES Classic is finally out. Whether you got one, already had a Raspberry Pi, or decided to give into the hype and go secure an original SNES through Craigslist instead, you should probably take a moment to bask in the awesomeness of the console’s best speedruns. In keeping with the SNES Classic theme (have you heard about it? It’s pretty great) I’ve selected only games that are playable on that it. Fortunately, that doesn’t really poise much of a problem since the library already contains many of the best games from that era. Once you’re done spending five minutes sucking in the nostalgia of every every game before hitting the reset button and moving onto the next, you might enjoy revisiting some of the more spectacular achievements speedrunners have managed with them. Maybe you never got to play Final Fantasy VI before and want to finally dive into one of the best JRPGs of all time, in which case you should totally do that. But once you’re done, or if you’ve already played the crap out of all these games at one time or another, it might be a good time to try a little speedrunning of your own. Just because you might not be the fastest in the world at any of the SNES’s games doesn’t mean you can’t draw inspiration from the below and start down the path. Despite being one of the easier games, Kirby Super Star takes surprisingly long to speedrun, even at any% (meaning you skip stuff wherever possible). 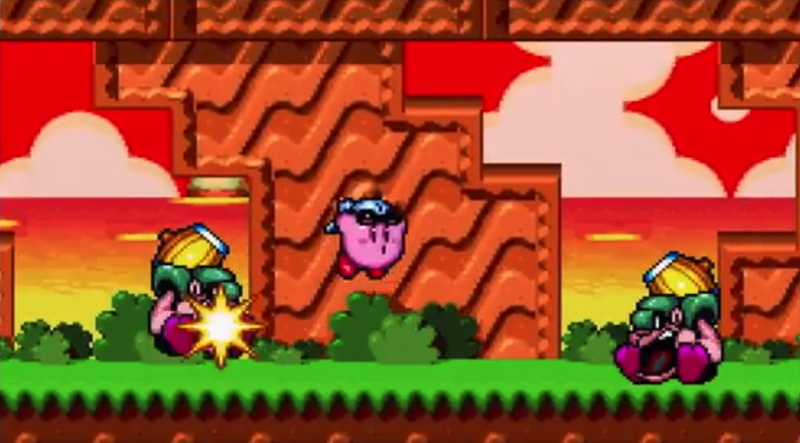 Unlike the SNES’s other platformers though, Kirby gets special powers, and the jet one in particular lets you fly through levels, beat bosses quickly, and even glitch through special squares. Kirby’s never gotten the same attention as Mario or Donkey Kong, but in the speedrunning context the series gets to showoff why it’s really a different type of game entirely. I mean, at one point you get to ride in a mine cart on a road made out of stars! One of the most unique games to speedrun on this list, Secret of Mana was known back in the day as being one of the few Square RPGs with true multiplayer. That factors into speedrunning because there’s an actual category for using two controllers at once to control an ally character and get through the game faster. Yagamoth is one of the game’s foremost runners, and since couch-op is kind of dead, you should probably take a second to learn from him how to play this monstrous multiplayer game while holding two controllers at once. Compared to Mario, Donkey Kong doesn’t jump that high and moves even slower. He does roll though, and if you channel that effectively, you can fly past enemies and obstacles with ease and elegance. Fortunately, the body of research on this game is extensive. Seriously. Donkey and Diddy actually move faster when when they roll into enemies, creating the ability to chain rolls together and extend the speed boost. It’s one of the game’s core mechanics and the biggest part of what makes speedruns of it so calming to watch. The bubbly green dinosaur’s first starring role, Yoshi’s Island doesn’t have rolls or special powers, but it does have egg throwing. As a result, there are a lot of weird animations in the game that can be manipulated to try and save time or just look really cool. One of these includes running while aiming eggs backwards. The game also allows you to stomp, letting you sink faster when necessary ground pound through doors into new areas at a small time savings. Finally, there are extended flutters wherein Yoshi’s regular iconic flutter in the air can be cheated into going further and allow players to reach key areas faster. The game is known for taking the Mario formula and adding some Metroidvania elements, but the simple animations added to the character to give it unique moves are what really set it apart. Earthbound is long, full of weird items and strange people to talk to. And to match that complexity and idiosyncrasy, it also has some of the most arcane speedrunning strategies as a result. In the glitchless category, people have gone all out to discover every little time saver, from dying faster during the Threed ambush to strict guides for when and where to buy which items. Doing all of them correctly condenses the epic journey into a mere few hours, but more than anything else speedruns of Earthbound do a wonderful job of highlighting all of the little details that make it so special. 100 percenting a game is no joke, but Mega Man X is more straightforward than most when it comes to beating every boss and grabbing every item. Even more than that, the game itself rewards you for doing so by bestowing upon the player a Buster upgrade that lets X perform a hadouken. The attack can one-shot most bosses and is integral to the run, slowing you down since it means picking up a lot of extra stuff (including all four energy tanks) but it also makes up for it by making the final boss a cinch to beat. Plus you might as well put all those great feeling dash jumps to good use. A turn-based fighting game with real-time elements and platforming, Mario RPG is a really unique project when it comes to speedrunning. It’s long and requires some random number generation manipulation that can feel counter-intuitive, but the real meant and potatoes of a Mario RPG run are the jumps. Because Mario’s special attack can be chained together by pressing B at the right time, you can actually kill most bosses from the start without any kind of grinding. You just have to get good at stomping on enemies over and over again. So get practicing. Few games have gotten as much speedrunning attention as those in the Zelda series, and A Link to the Past is no exception. It also has some major glitches. Like, a lot. So much so that in a run like the above you can actually finish the game in under two minutes. Link wakes up, throws a couple of bushes around, and then start menu’s himself into the very fabric of the game before descending through unseen layers past the final boss fight against Ganon into the end of the game. It’s short, but the exploration glitch in Link to the Past is by far one of the coolest out of any on the console. No cape, no Starworld means for this particular category you have to speed through the game without flying or using the conventional warps to get to Bowser’s castle. That doesn’t mean you won’t get to use special tricks like getting Yoshi to clip through a level or even Mario himself on water levels. It’s a good mix between learning how to break the game and actually going through and completing each world roughly as the designers intended. By far one of the most challenging SNES games to speedrun, Super Metroid is probably also one of the most mesmerizing to watch. Take any long arduous climb or cavernous drop and you can begin to see the game morph into something most of us wouldn’t recognize from our own time with the game (31:20 in the above run for instance). When it comes to the any% run, there are different routes you can take as well, with one being slightly slower but more welcoming to newcomers. Of course, many of us would be contented just to be able to beat the game in a single sitting.